Edith Chinlund Brown died peacefully on Jan. 5, 2019, just shy of her 83rd birthday. Edie was born on Jan. 13, 1936, in New York City. She was the daughter of Edwin F. Chinlund and Helen Chinlund of New York and Vineyard Haven. She grew up on Gramercy Park, and attended Friends Seminary. After high school, she attended Wheelock College in Boston. She met her future husband, Arnold K. Brown Jr., when she was 16 years old. Brownie, as he was known, was the Harvard roommate of Edie’s older brother, Steve Chinlund. Edie and Brownie married in New York on June 18, 1955, soon after graduation. Edie moved with Brownie as he served in the U.S. Army in Frankfurt, Germany, and then various U.S. posts. After their Army years, Ed and Brownie settled in Barrington, R.I., with their daughters, Lynne and CIndy. Edie was busy raising her children, and was active in the League of Women Voters. Edie summered on the Vineyard every year of her life with her family, and she and Brownie bought their home on Grove Avenue in Vineyard Haven in 1970. They moved to the Island full-time in 1974, and embraced their long-awaited year-round Island life. They purchased Woodchips Designers, and grew the business from its original roots on Beach Road in V.H. to the State Road location, employing many Islanders along the way. After they sold the company, Edie started her beloved career in real estate, working with the wonderful team at Landmarks Real Estate in Vineyard Haven. She liked all aspects of the Vineyard real estate business, and that career was a perfect fit for her. 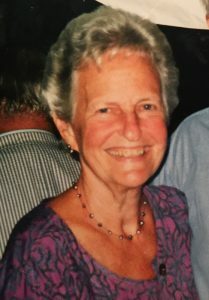 Edie was a member of the Vineyard Haven Yacht Club for over 80 years, and her family enjoyed time on the water. She and Brownie owned several boats, including one of the first Wasque 32 built by the M.V. Shipyard, later to become the Vigilant II for the VHYC. They also enjoyed sailing on Chilmark Pond in their catboat, with long picnics across on South Beach. Their schooner, Good Fortune, was a fixture in Vineyard Haven Harbor for years, and they enjoyed many sailing adventures with Island friends. Edie and Brownie enjoyed birding, and traveled regularly throughout the U.S. and Great Britain, adding to their life bird list. She enjoyed walks at Felix Neck and Cedar Tree Neck, and supported local conservation efforts. Edie was active with Island Elderly Housing as well as the West Tisbury Congregational Church. Edie loved knitting and needlepoint, jigsaw puzzles, and a good mystery book. She spent many summer hours on the beach, chatting with friends. And she made an excellent tuna sandwich. Edie was diagnosed with Parkinson’s disease at age 51, and she participated successfully in several research studies at Massachusetts General. She bravely met each life change with grace and strength. Over the years, Edie moved from her Grove Avenue home to Havenside, and then to Windemere, where she received wonderful attention from a loving group of caregivers, in addition to her family. Edie was predeceased by her husband, Arnold K. Brown Jr., her son-in-law James Andrews, and her granddaughter, Meagan Andrews. Edie is survived by her brother, Stephen Chinlund, and his wife, Caroline, of New York; her daughters Lynne Brown Strang, and husband, Ed, of Burbank, Calif., and Vineyard Haven, and Cindy Brown Andrews of Edgartown; her grandchildren, Tabitha Andrews, and fiancé Mike Williams, of Hyannis, Trevor Strang of Burbank, Kurt Strang, and wife Erica, of Seal Beach, Calif., April Strang Sheriff, and husband Dave, of Highlands Ranch, Colo.; her great-grandchildren, Lukah Vieira of Edgartown, Michael Williams of Hyannis, Slater Strang and Summer Strang of Seal Beach; and many nieces and nephews. As is family tradition, Edie’s ashes will be scattered in Vineyard Sound, off West Chop. She was very loved, and will be deeply missed.